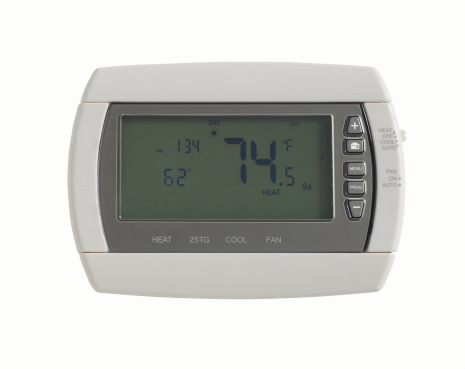 The digital display on most modern thermostats is powered by replaceable batteries. Some units have a low battery indicator to let you know when to replace the batteries, but it is a good practice to replace the batteries once a year to insure the thermostat will not malfunction due to low battery power. Replacing the batteries more often also prevents older batteries from leaking and damaging the thermostat. Release the external battery holder from the thermostat housing by pressing down on the tab on the top edge of the thermostat. Remove the battery holder. Remove the batteries from the holder by pushing them out with your finger through the access hole in the holder. Place new alkaline batteries into the slots as indicated on the holder. Push the battery holder into the slot on the thermostat until it snaps into place. Remove the thermostat cover from the wall plate to replace the batteries if your unit does not have an external battery holder. Hold in the tab at the bottom of the thermostat while gently pulling it away from the wall plate. Remove the batteries from the inside of the thermostat cover by prying them out with your finger. Install new batteries in the correct direction as indicated on the thermostat cover. Push the thermostat cover back into place until it snaps into position.